Shale. (Norse = scale; Germ. = schale). Thin shale beds between thicker greywackes, St. Aubin to Belcroute. Shales are fine grained, compact claystones and siltstones which are fissile, ie. they split easily into thin pieces with flat or curved surfaces. The grain size varies from < 4 µm for clay (<1/250mm) to 4 µm - 62.5 µm (1/16mm) for silt on the Udden-Wentworth scale and they are generally composed of clay minerals or silt-size particles (clasts) of quartz (Allaby & Allaby, 1990, pp. 491, 497 & 398). 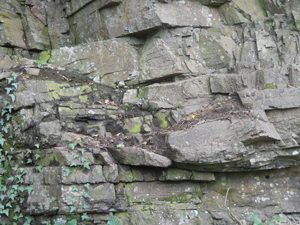 In Jersey, shales occur in the Jersey Shale Formation and form a minor part of the Formation, interbedded with Sandstones and Greywackes, and associated with Conglomerates. They crop out in Associations I, II, III & IV (Bishop & Bisson, 1989, p. 9) across the western and central parts of the island between the Northwest and Southwest Igneous Complexes as far east as their contact with the Southeast Igneous Complex and their junction with the overlying Andesites of the Jersey Volcanic Group. 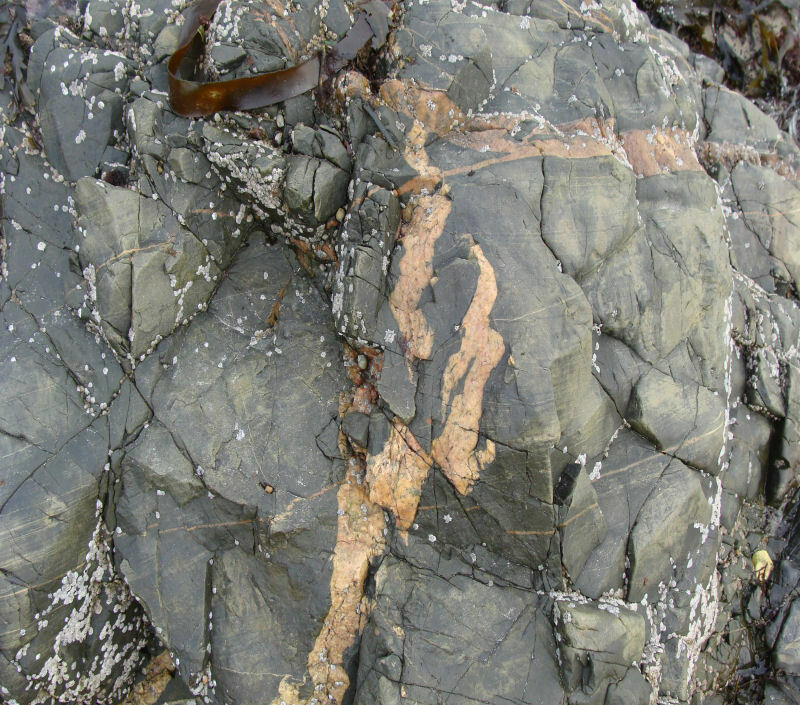 veins in the Jersey Shale outcrops along the northern harbour wall. 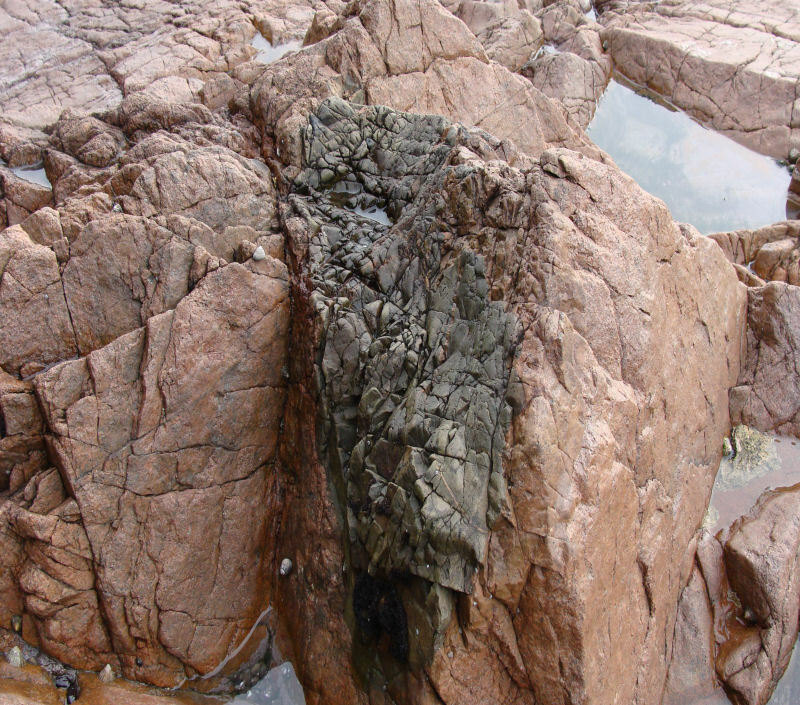 Isolated outcrops also occur along the northern edge of the southeast complex as far east as Gorey harbour where the contacts with the SE granite are well exposed, and at La Belle Hougue Point in Trinity and in Le Mont Mado granite, St. John. They are considered to be late Brioverian (Upper Proterozoic) in age, named after Briovère ('bridge over the Vire') the Gaulish name for St. Lô, the type area in Normandy. 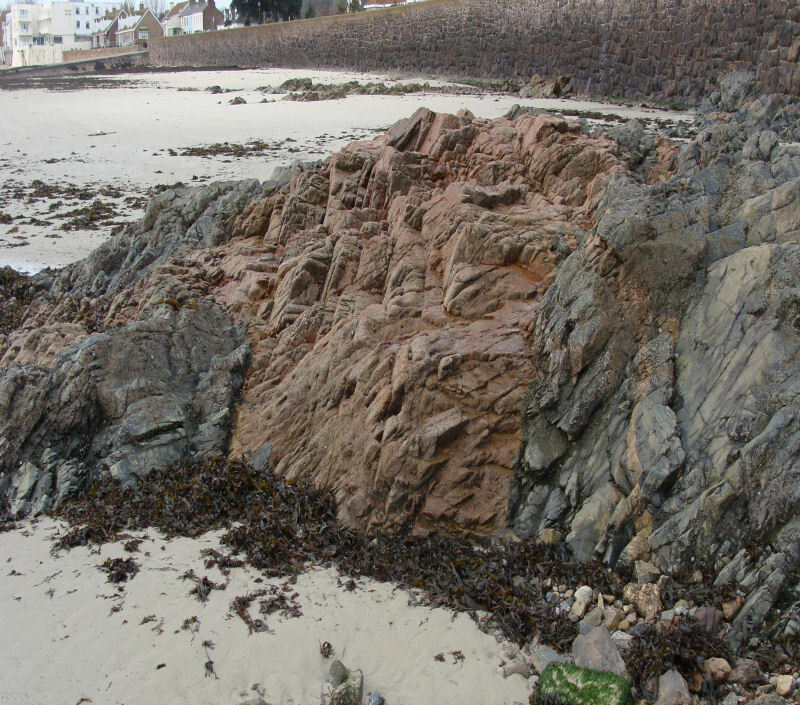 It is noticeable that St Ouën's Bay in the west and St. Aubin's Bay in the south coincide with the shale outcrop, which suggests that their formation was governed by the faster erosion of the softer shales and the slower erosion of the harder granites. Thin shales between greywacke, La Saline. Shales are well exposed at the northern end of St. Ouën's Bay in Le Pulec, an inlet near L'Étacq, and on the wave-cut platform immediately to the west and south. Contacts with the granite are beautifully exposed in the inlet and in a small quarry further south. A typical exposure occurs in a roadside quarry above the slipway at L'Étacqerel. 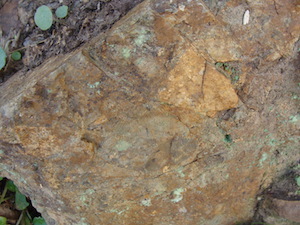 Here, there are laminated mudstones with sole markings showing flute and bounce casts (Association IV). Below the slipway, there are interbedded fine grained sandstones exhibiting ripple laminations, graded and cross-bedding and boudinage, which also form part of Association IV (loc. cit. p.9). Further south, in the low outcrops west of La Saline slipway, the interbedded shales and greywackes are steeply dipping (nearly vertical) with folds striking north-south and plunging southwards. 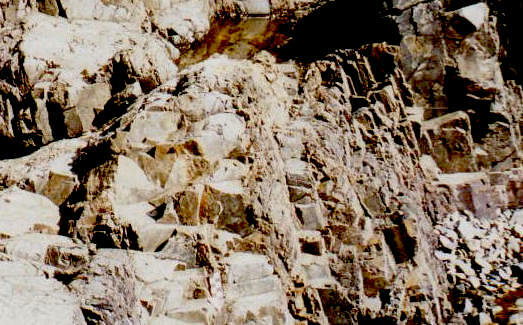 There are many quartz veins of differing thickness and also thin, pink granitic veins. Some of the quartz infilling appears like the typical saddle reefs (phacoliths) which follow the crests and troughs of folds concordantly. They form fossil cliffs at the back of St. Ouën's Bay where they are exposed in one small quarry on Le Mont Matthieu where they exhibit excellent ripples as sole markings; from here they are exposed in quarries and cuttings inland. Inland, quarries and roadside cuttings in La Route de la Vallée (St. Peter's Valley) and up Le Mont Félard also reveal dark grey laminated shales interbedded with thin light grey cross bedded sandstones. In the former they dip at 25 - 30° in a general easterly direction, while up Le Mont Félard and along Le Chemin des Moulins (Waterworks Valley) they dip at 70 - 80° to the south east. At the former, it is noticeable that along their erosional contact with the soil profile, the ends of the beds are bent down hill, illustrating the effects of soil creep. On the south coast, the shale crops out from St. Aubin's harbour south towards Belcroute Bay where they dip steeply south eastwards and their bedding planes form steep seaward cliff faces. 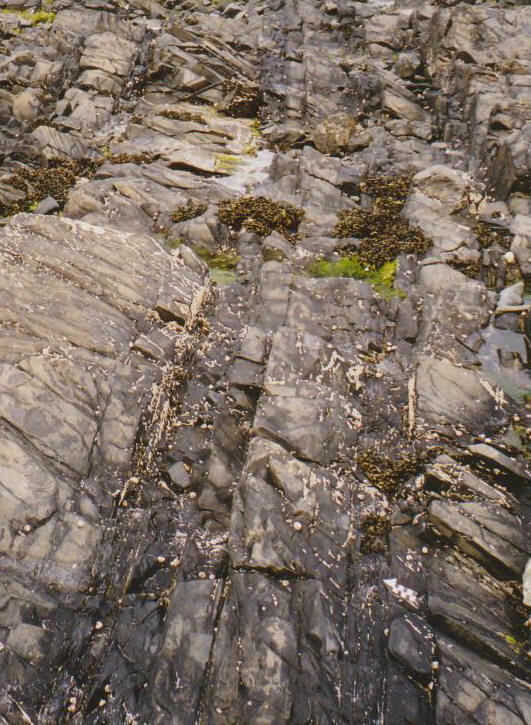 Here, they are interbedded with the light grey cross bedded siltstones and sandstones, but are also intruded by various dykes and show mottling and possible distortion in beach outcrops near the junction with the Southwest Igneous Complex (Nichols & Hill, 2004, pp. 27 - 37). The associated Sandstones and Greywackes (Associations III & IV) are best revealed in the west and north west on the wave-cut platform west of L' Étacq, while one of the Conglomerates (Association 1) crops out in St. Peter's Valley near Gargate Mill (Bishop & Bisson, 1989. p.7). Lenticular bodies in Les Gellettes Quarry. Lenticular bodies form only a small outcrop in the southern part of St. Peter's Valley (Association II). The Formation is very well bedded with beds varying from several centimetres to c.1m thick. They have been folded several times during the Cadomian Orogeny (named after Cadomus, the Roman name for Caen in Normandy) about various axes, generally E-W and N-S, and anticlines and synclines exhibit various strikes and fold styles with vertical limbs in some areas and plunging axes in others. These are excellently described and illustrated by Bishop & Bisson (1989. pp. 72 -75) who also reference the previous structural work of Noury (1886), Mourant (1933), Casimir (1934), Squire (1974) and Helm (1983, 1984). Links with Normandy and Brittany are described under the relevant headings elsewhere in the website. The four Associations reflect deposition in different parts of a submarine fan and as the shales with their field relationships and sedimentary structures are representative of Assocs. II & IV, they would be parts of the mid fan and outer fan deposits respectively (loc. cit. 1989, p. 11). Noury, Ch. 1886. Géologie de Jersey. Paris: F. Savy; Jersey: Le Feuvre.